This year has been a struggle when it comes to weight gain for me. I just seemed to hit a wall, and gave up. Shame on me. Well, this year is going to be different. My problem before always seemed to revolve around unhealthy eating out of convenience. Like most moms, I am busy! I spend quite a bit of time in my car going to and from school and activities, and when I’m not in my car, I am working and trying to keep my house up to par. This year, I have decided to think ahead and plan my meals. 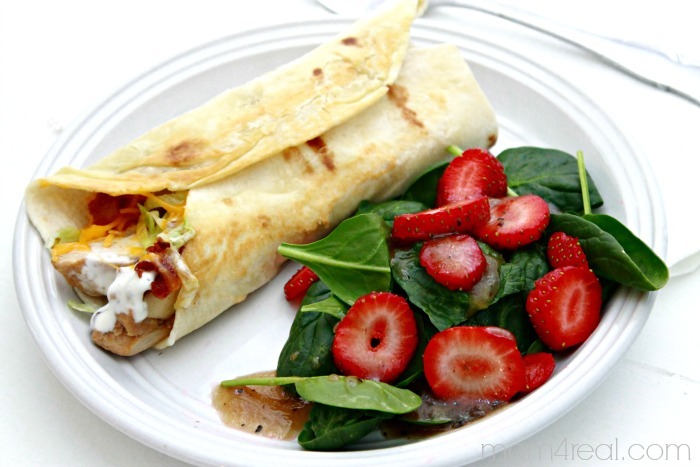 My new favorite go to healthy meal is a Easy Low Carb Grilled Chicken Wrap with a spinach salad on the side! Here is how I make mine.. 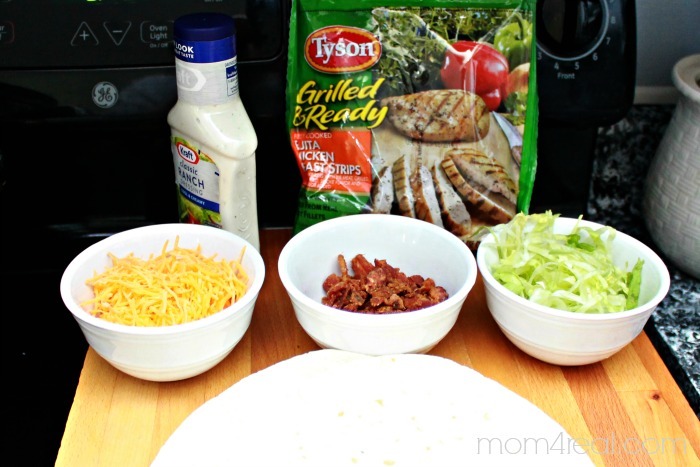 I start with Tyson Grilled and Ready Fajita Chicken Breast Strips. They come in a resealable package so I can use one package for several different recipes or meals. I also use some shredded cheddar, shredded lettuce, crumbled bacon, ranch dressing and low carb wraps. I simply add a few of the grilled chicken strips to the middle of the wrap, sprinkle on cheese, lettuce and bacon, then add a small amount of ranch and wrap it up! 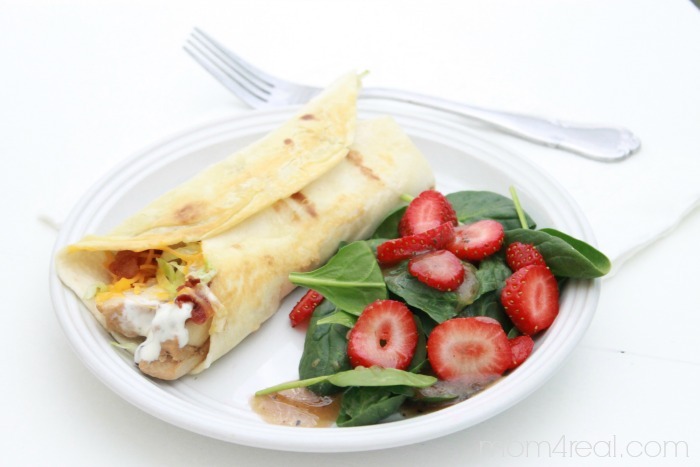 The key to making this wrap super scrumptious is heating a little olive oil in a pan and searing both sides of the wrap. 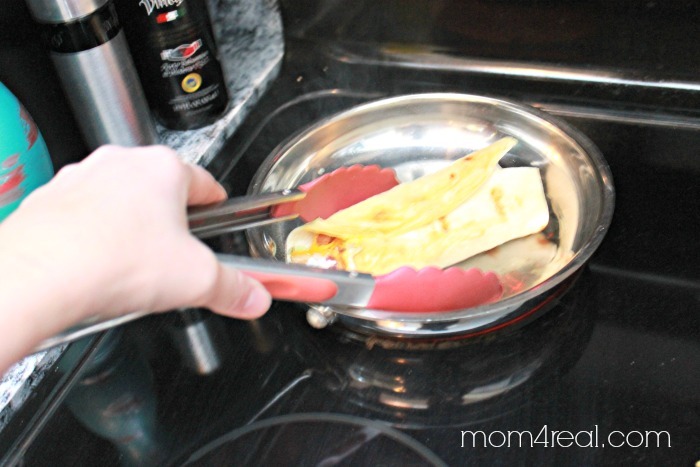 Believe me, it makes the wrap sooo much better, and it keeps your wrap from falling apart! I add some baby spinach with sliced strawberries along with a touch of balsamic vinaigrette, and my meal is complete! I usually can’t even finish the entire wrap…it’s super filling! This has become a family favorite too, and is a healthy alternative to my fattening chicken enchiladas!The grilled and ready chicken and steak options have quickly become some of my favorites. I usually grab a few packs every time I’m in Walmart to help me knock down the prep time of my salads, pastas and soups. They are a mega time saver and healthy too…win, win! « Weekly Goals Printable ~ Free Printable!